As a pastor I read Paul’s letters to Timothy often. 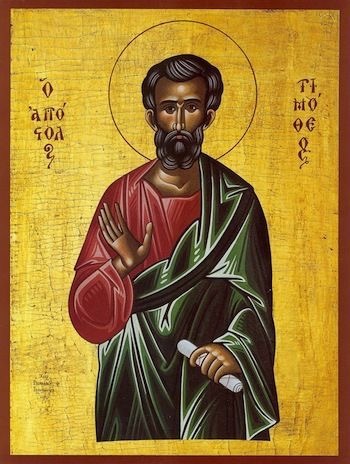 Timothy was Paul’s protege of sorts. He was young and seems to have been a courageous man. According to christian tradition at the age of 80 Timothy was dragged through the streets and stoned to death for trying to disrupt a religious procession for the goddess Diana. One day it occurred to me to read this letter from a different point of view. I’m reading it slowly imagining that Timothy is the pastor of the church I’m a part of in my city. I imagine gathering with our missional community in our neighborhood. Timothy is there, week in and week out. Questions always come up about what it means to live as citizens of God’s kingdom here in this place. I listen to what he has to say when he chimes in. I see how he listens, how he handles the ideologies and frustrations of others; how he handles his own. It puzzles me how he gets fired up over some things while appearing disinterested in others. I don’t always agree with what he says. I don’t always see what he sees. I imagine myself gathering with the church in our large gatherings on Sundays. As one people we share in the liturgy, hope to hear a word from God, and come to the Lord’s Table. But before the Eucharist I can see Timothy come before us, open the Scriptures, and speak. He invites us to imagine what it could look like if Jesus is King. He reminds us of things we know but have forgotten, or maybe dismissed. We are stirred. We are convicted. We are hopeful. At times I confess that the words he shares irritates me, sometimes confounds me and sometimes comforts me. The way he talks about what the Spirit could be up to out ahead of us both excites me and bothers me. Then he turns his attention to the Eucharistic Table. There he invites us to remember whose we are and who we are. Some Sundays what he says is resolved at the Table. Sometimes it creates tension. But at the Table it makes a little more sense and we find a way to move forward in light of it all because Jesus is Lord and we’re in this together. We can join His Spirit who is at work among us, between us and out ahead of us. We can love each other, our neighbors and our enemies. And we can trust God with the consequences because He loves us. Reading Timothy this way is sobering. No wonder Timothy was dragged through the streets and stoned to death.